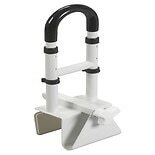 A bathtub safety bar is a valuable piece of home equipment, and for some families, it is a necessity. Thanks to innovations in design and engineering, adding a bathtub safety bar will not detract from your bathroom's decor and can seemlessly blend into the background of your shower. 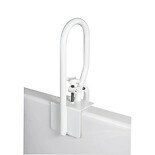 You might consider a wall-mount bathtub safety bar, especially if you are already completing bathroom renovations. 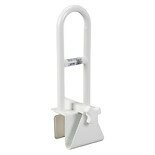 In addition to no-slip bath mats, wall-mount safety bars are important for safety during a shower. 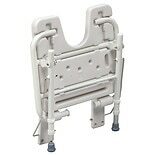 Especially for the elderly, it is crucial to be able to quickly grab a stable surface while in the shower. Falls are prone to happen in the shower because showering often involves standing for long periods on a slippery surface. Also, the steam and heat can impair reflexes. You should also consider safety bars that mount on the side of the bathtub. 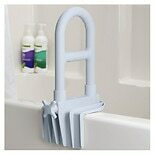 Tub-mounted safety bars are important for safely getting in and out of the bathtub. 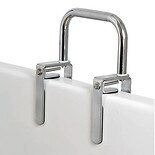 Tub-mounted safety bars attach to the sides of the tubs with screws or other mechanisms. You may want to consider both types of safety bars, in conjunction with other safety features like shower seats, especially if you are setting up a shower for an elderly person. 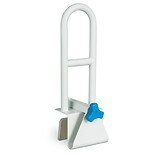 You can buy a bathtub safety bar in white, chrome, and other colors that will complement your existing decor. You may wish to allow the person for whom the bar is intended to select a material that will be easy to grip.